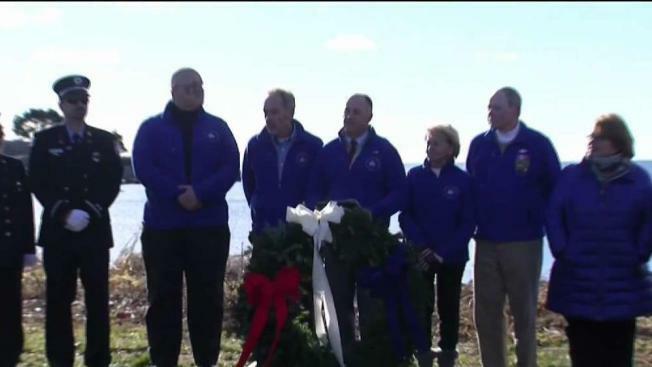 People in Kennebunkport, Maine, paid their respects to former President George H.W. Bush Tuesday with a wreath-laying ceremony. Since Saturday, people have been stopping by Walker's Point to drop off items at a memorial for President George H.W. Bush. On Tuesday, it was time for town officials in Kennebunkport to do the same. Selectmen have hung a large wreath across the street on Ocean Avenue. A white ribbon contains a distinguished flying cross medal, the same award President Bush won when he was serving in World War II. "We will miss you, Mr. President, but we are awfully glad that we knew you," said Ed Hutchins, chair of the Board of Selectmen, and former groundskeeper at Walker's Point. Hutchins worked for the Bush family from 1984 to 1988. He was hired to be a groundskeeper when he was 17. "I had this little view into their world," he said. Mr. Bush was vice president at the time. "I got to see how he interacted with people, and that was the thing that really stuck in my mind. and made him, in my opinion, one of the greatest men of all time," Hutchins said. Bush took an interest in Hutchins, and always asked how he was doing in school. When it came time to look at colleges, Hutchins said Bush took him to Washington on Air Force Two to visit campuses, and let him stay at the Naval Observatory. Hutchins said Bush paid out of his own pocket to take him to the Republican National Convention one year, because he was studying political science in school. "I think [those experiences] gave me the sense that I had to give back," said Hutchins. "It's important to give back, and that's why I'm the chair of the board of selectmen in our town today."